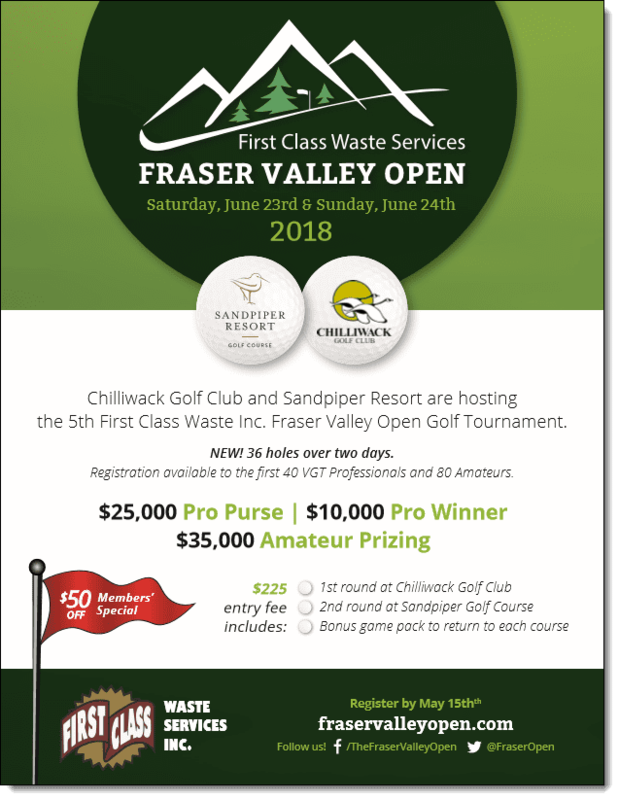 2018 FIRST CLASS WASTE SERVICES INC.
Chilliwack Golf Club and Sandpiper Golf Course are excited to announce the 5th ANNUAL FIRST CLASS WASTE SERVICES FRASER VALLEY OPEN. This two day, 36-hole tournament will host 40 of BC’s leading Golf Professionals and 80 Amateur golfers. "The Fraser Valley Open will be one of the largest prize purses on the Vancouver Golf Tour (VGT) ‘order of merit’ schedule, and we are excited to partner with Fraser Mulholland and the VGT" stated Organizing Committee Member Bryan Ewart. This is an open event for Amateurs. Priority will be given to the first paid entries. All amateur participants must have a valid Golf Canada HDCP not to exceed 18.0. Professionals must be a 2018 VGT Member in good standing. The top 10 eligible VGT Pros from 2017 Order of Merit + top 10 VGT Pros on 2018 Order of Merit (as of May 30th) are exempt in the field and have until June 15th to register to hold their spot. MONDAY, JUNE 18 at 6:00pm PST or when the event is full (whichever comes first). 8:00am Start. Final Tee-time at 2pm. Times subject to change based on field size. FREEDOM 55 FINANCIAL OPEN EXEMPTION FOR TOP VGT PROFESSIONAL! The top VGT Member* on the SRIXON/CLEVELAND Order of Merit at the end of the VGT PLAYER’S CHAMPIONSHIP on May 18th will earn an exemption into the MACKENZIE TOUR’s FREEDOM 55 FINANCIAL OPEN event at Point Grey Golf & C.C. (*Not already exempt into the F55 Financial Open). SRIXON / CLEVELAND ORDER OF MERIT WINNER: $2,500 Q-School Award! The top Professional for the entire VGT season (Championship Series & Majors Series) earns a $2,500 Q-School Award at the end of the 2018 Tour Championship. The VGT Majors Series starts with the VGT MASTERS on April 26 & 27 at Morgan Creek Golf Club includes 8 multiple-day events below. At the end of the 2018 JOHNSTON MEIER INSURANCE VANCOUVER OPEN, the VGT Majors Series will offer a guaranteed $2,500 in Cash Bonuses! TOP SRIXON / CLEVELAND STAFF PLAYER: $1,000 CASH BONUS! ROOKIE OF THE YEAR: Presented by the TSN DISCOUNT GOLF CARD! $1,000 CASH BONUS! MOST IMPROVED PLAYER OF THE YEAR: $1,000 CASH BONUS! FEMALE PLAYER OF THE YEAR: $500 BONUS! There must be minimum of 10 female 'OPEN DIVISION' Members for award to be given out.